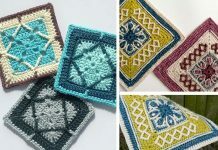 This Ocean Themed Granny Square Afghan Series Crochet Pattern makes a very simple yet elegant granny square that’s the foundation of all quilts and blankets. Make one now with the free pattern provided by the link below. As I stated before, you can stitch these squares together to make a large blanket or quilt that matches accordingly with whatever size you want it to be. You can also mix and match these squares with some other ones that we made as well. 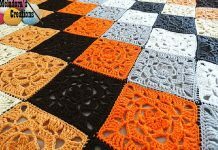 This is very easy and repetitive to make which makes it the perfect starter for creating blankets and quilts. If you ever get bored, you should try making a few of these. Who knows? You might end making a large blanket or quilt without realizing it. 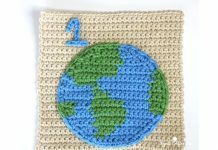 Thanks Maria’s Blue Crayon for sharing this free crochet pattern.The link for the free pattern is provided below photo. Happy crocheting.